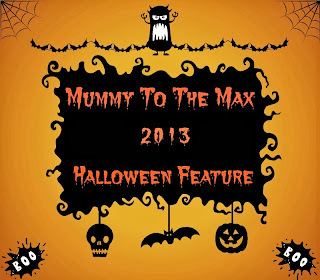 I have always adored dressing Maxwell up and Halloween is not a exception! Last year Maxwell dressed up as a pumpkin, a skeleton and even a spider but this year I wanted to go the extra mile. Even though Maxwell is small, I am always on the look out for unique ideas to make Maxwell's outfit that little bit more special. I was recently contacted by Inch Blue and they were able to offer me just the right thing I was looking for. Maxwell and I were sent some lovely spider themed leather shoes from Inch Blue. As soon as we set eyes on them I knew they would be perfect to wear for Halloween, not only round the house to keep his feet warm but also out and about. The shoes were presented in a lovely gift bag which was clear. The bag had handles which made the shoes easier to carry around and made it easier to attach to our changing bag. Once removing the shoes out of the gift bag we were very impressed. The shoes are very soft, I am normally a worrier about what I am putting on Maxwell's feet but I felt happy that these would fit Maxwell's feet well. All the shoes come in different sizes which gives you the option to get the perfect fit for your child. We choose size 18-24 months and the measured well on Maxwell. The shoes are made from soft natural leather and they have non slip suede soles which makes them perfect for our house as we have wooden floors. They are very easy to get on and off and they are secure on Maxwell's feet as he walks around. I love the unique designs Inch Blue offer, they have come up with many designs to suit many children's ages. The spider shoes we were sent are in red and blue but you are also able to choose them in a Turquoise colour. I am excited to see what Inch Blue come up with for Christmas! Overall I highly recommend Inch Blue, whatever occasion you are looking for shoes for I am sure you can find them over on Inch Blue's website. I did not receive any financial reward for writing this review. However we did receive the product for review purposes. Everything written in this post is my own, honest opinion.